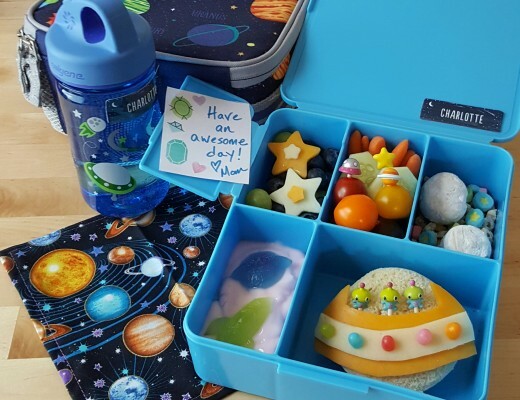 In this post, I am going to feature a whole bunch of lunches from one of my recent busy lunch packing nights. 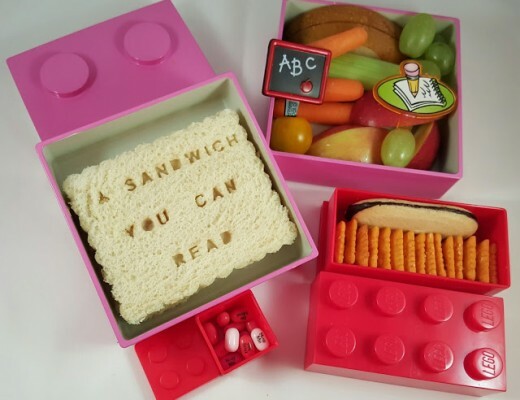 A jam-packed lunch post seems in order since this is my 100th post for this blog. There are times when I pack lunches for two or three days at a time. 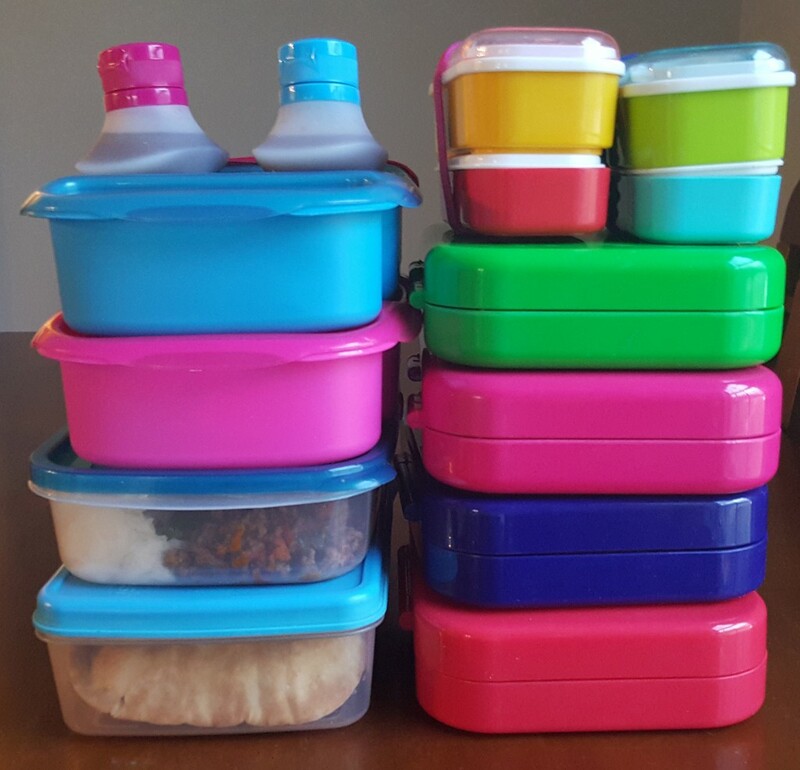 This is usually when I know I will be traveling for work so I want to prepare food for everyone ahead of time or when I know we will have a really busy evening with little lunch packing time available. The lunches in this post are from a recent week when I knew I would be getting home late the next night. First up, I have some lunches for my kids packed in a couple of my original “real” bento boxes from Japan. 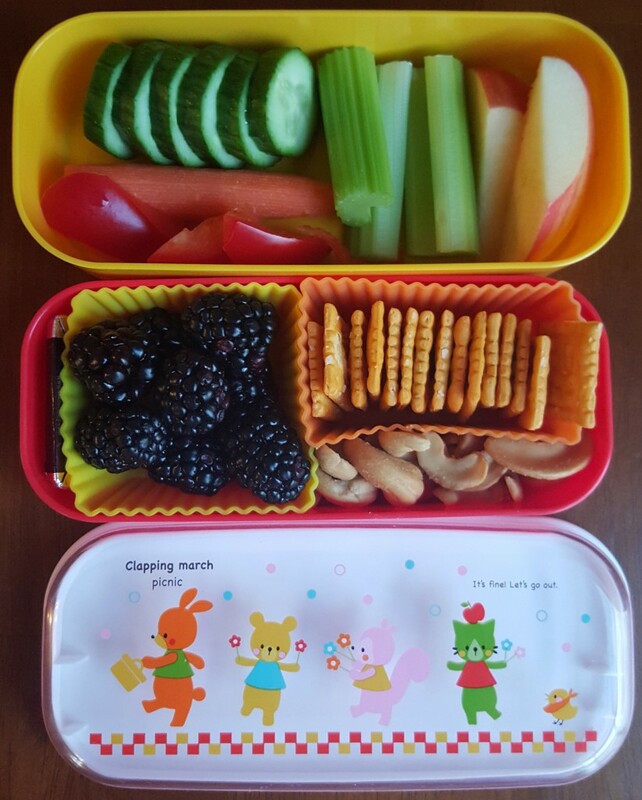 I got these back in 2012 when I first became interested in this style of lunch packing. The lids of these boxes are cute! 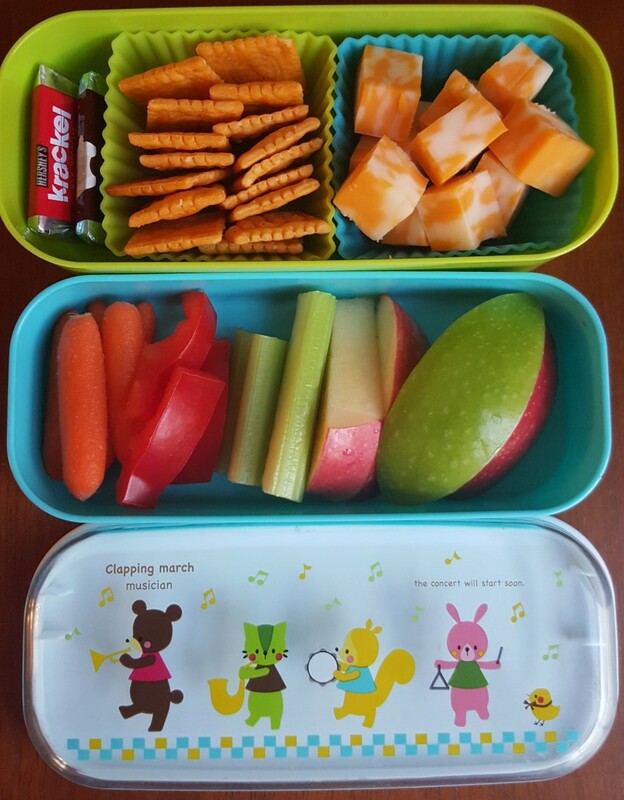 My daughter had crackers, cubed Colby cheese, chocolates, veggies, and apple slices. This lunch was packed lightly on purpose because she had a cold and little appetite. 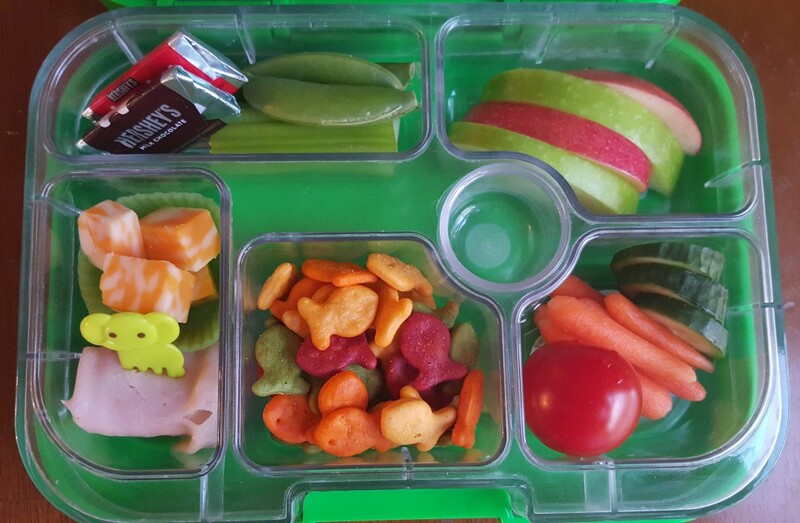 My son’s lunch included veggies, apple slices, a chocolate, blackberries, crackers, and cashews. He also had some yogurt in a separate container. 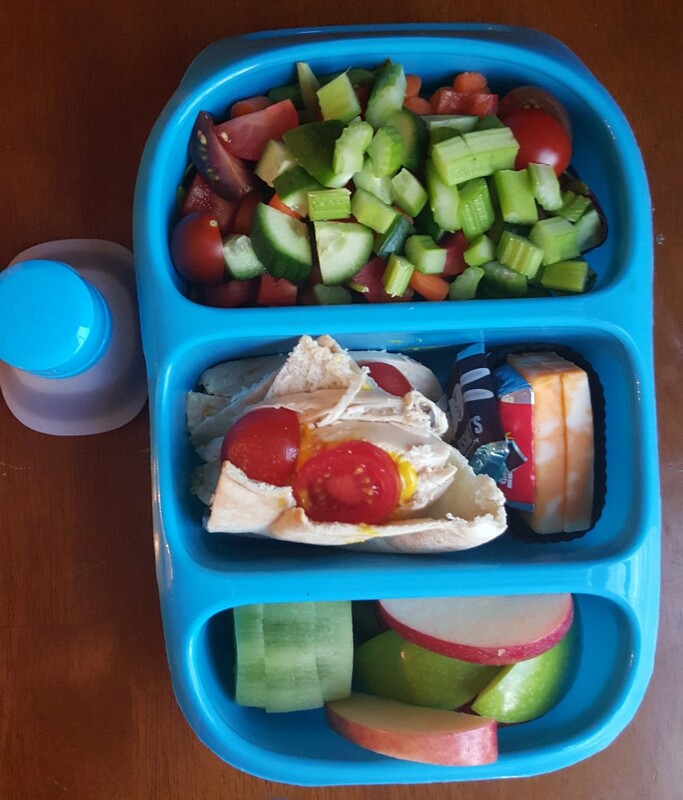 I used Yumboxes for the second day’s lunches because the seal on these keep each section nicely separated allowing the items to stay fresh even with multiple days in the refrigerator. The lunch above was for my son. 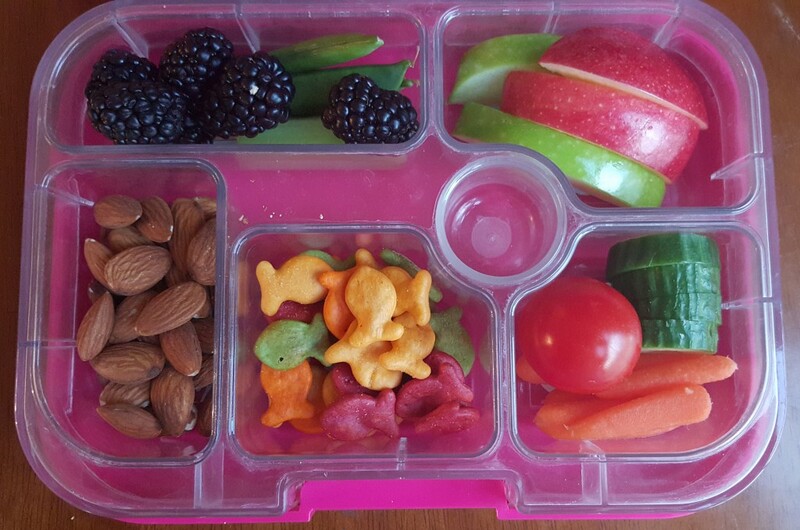 He had apple slices, veggies, Goldfish, almonds, blackberries, and sugar snap peas. 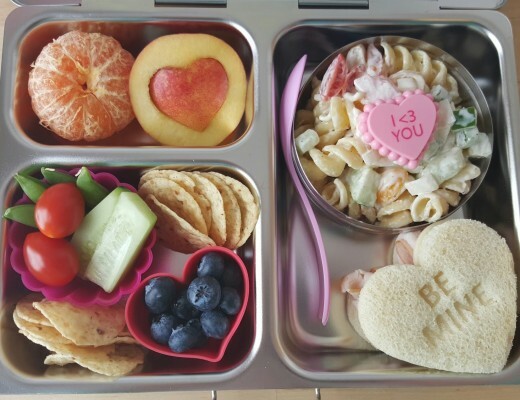 This lunch was for my daughter. She had turkey and cheese instead of almonds and chocolate instead of blackberries. Next, I have lunches for work. For the first day, I used our Goodbyn Bynto boxes. These held a salad in the top section, roasted chicken on pitas in the second section with chocolates and cheese slices on the side, and kiwi and apple slices in the bottom section. I used little containers to hold balsamic salad dressing. The pictured lunch was for my husband, and I had a similar one. 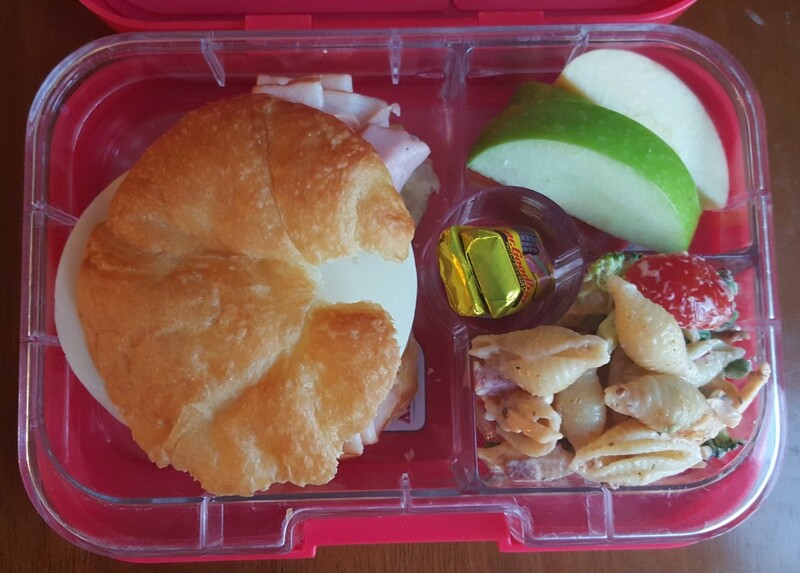 I used Yumboxes for day two adult lunches too. We had turkey and provolone on croissants in the main sections. 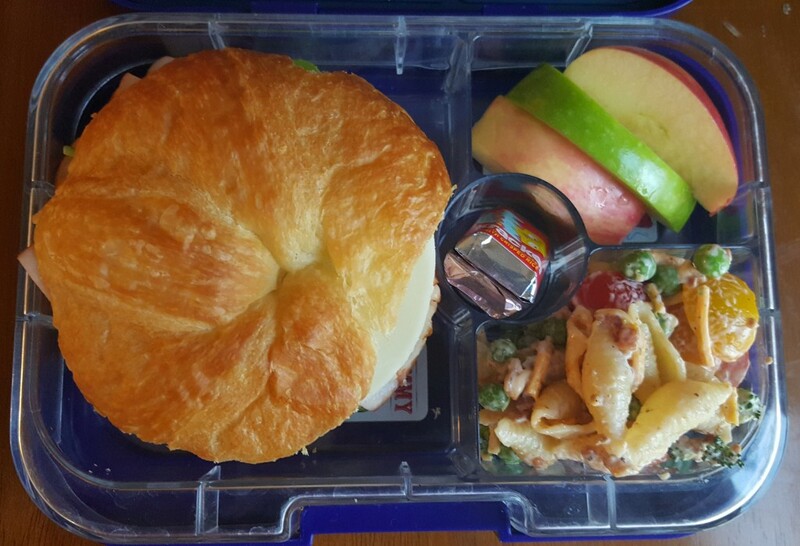 The side sections held apple slices, chocolates, and a bacon & ranch pasta salad. I used this Broccoli Bacon Ranch Salad recipe from Julia’s Album as a guide. Here, you can see the lunches all stacked up from this round of lunch packing. This photo includes boxes for two more lunches I will share in future posts. In all, I made ten lunches on this night! With some practice, it’s not too hard to crank out a lot of lunches all at once! I love all of the lunches, they look so delicious!! Happy 100th post and here is to many more! Thanks Rina! Maybe one day I will have a catalog of lunches as large and impressive as yours.